There are many varieties of ad blockers, normally available as browser extensions or plug-ins, which generally work by suppressing the active code on pages serving adverts or otherwise tracking users. Users have some element of control over the types of adverts to be removed (blacklisted) or shown (whitelisted). Some software, such as Ghostery, which sells itself more as a privacy solution, exposes all the trackers active on any given webpage (ie not just visible adverts) and enables you to block them individually. PageFair estimates that ad blocking will cost publishers nearly $22 billion during 2015 in lost advertising revenue. Despite some extravagant claims by those with vested interests that ad blocking will “break the internet” and is unethical, the reaction of publishers has been relatively muted so far. In October 2015 City AM became the first UK newspaper to prevent visitors using ad blocking technology from reading their news stories, identifying ad blocking users and presenting them with blurred text and a message urging them to disable their ad blocking software. Trinity Mirror, owner of the Daily Mirror, is also reportedly considering banning ad blockers. The Guardian has taken a different approach which provides more carrot and less stick, displaying a banner suggesting that ad blocker users might like to support its journalism in return for a few perks. Furthermore, as discussed below, some media companies have attempted legal action. Although many of the arguments against ad blocking technology involve predictions that it will lead to the death of newspapers and publishers reliant upon advertising revenue, it’s worth noting that a far larger and, arguably, more powerful business is being threatened – Google. Its primary business model relies on viable online advertising, with revenues from this stream accounting for the vast majority of its revenue – almost $60 billion a year. Although Google has not reacted in any obvious way such as banning ad blocker extensions for its Chrome browser, it has already made payments to Eyeo GmbH, the parent company of Adblock Plus, to include it in its Acceptable Ads policy which allows adverts deemed not too disruptive or intrusive to users, to be added to a whitelist and thus pass through its filters. Another ad blocking extension, Adblock (no connection), was recently sold to a mystery buyer, with some speculation on forums that it could be Google. Although the legal arguments against ad blocking software are not obvious, various grounds have been raised in recent cases brought in Germany (where 30 per cent of internet users have ad blocking software) by RTL and ProSiebenSat.1, Die Zeit and Handelsblatt and Axel Springer against ad blocking company Eyeo GmbH, whose Adblock Plus software is installed on 50 million computers worldwide. These grounds are competition, copyright and violation of terms and conditions. As some of the most widely used ad blocking software is open source and there are many different offerings from a variety of sources (both companies and individual developers) it’s difficult to make accusations of anti-competitive practices or market dominance stick. In one of the cases, Eyeo were accused of acting like medieval “robber barons” in monetising their Acceptable Ads program which whitelisted “acceptable” advertisers for a fee. But Munich’s district court ruled that the software was not anti-competitive because internet users chose whether to install it, and that it did not have enough market dominance to prevent adverts from reaching a “sufficient number” of internet users. Comparisons have been made between ad blocking and piracy in that both use technology to divert revenue away from distributors of copyrighted material. However, in the case of ad blockers, the only copyright infringement that would appear to potentially exist is modification of the publisher’s webpage (in that the intended adverts do not appear). So far, all copyright infringement claims have failed. ave the opportunity to decline a website’s terms and conditions before they land on one of its pages. So far, it seems that legal ammunition aimed at ad blocking companies has been somewhat ineffective. However, it’s worth noting that the most recent case involving ad blocking prompted Eyeo to set up an “independent board” to oversee its list of Acceptable Ads. Only time will tell if further legal action – possibly on different grounds – will have more of an effect. 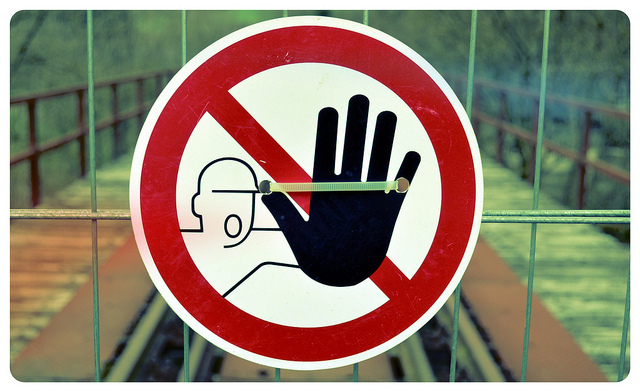 Image: Stop! by Axel Schwenke on Flickr.